Many times customers are looking to get a single opening with a combination of these specialty attributes. To provide you with an idea of what attributes are available with each other, I’m going to start a Multi-Solution Products mini-series in which we dive into certain assemblies that feature multiple specialty attributes one at a time. Getting back to the Multi-Solution Products series, we’re sticking with Sound Transmission Class (STC), but this time showing the capabilities with Stainless Steel. ASSA ABLOY STC products can be provided with stainless steel material in a variety of finishes on all models – up to, and including STC 66. With doors and frames, the majority of the sound dampening materials are built into the inside, or “guts”, of the product. Other components that aid in controlling noise are applied to the finished door or frame. These components are perimeter seals, door bottoms, thresholds, and certain types of hardware such as cam-lift hinges. 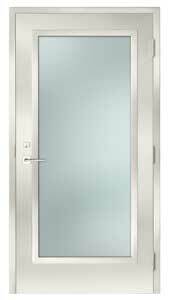 This allows the doors and frames to utilize the cool, modern finish of stainless steel as their “skins”. The stainless steel alloys used are either No. 304, for aesthetic purposes, or No. 316 for highly corrosive environments. A variety of finishes include brushed satin (No. 4), fine satin (No. 6), mirror (No. 8), mill (No. 2B) and XL blend (XLB). For STC applications, door skins can be made using 16 or 14 gauge material with various core options depending on the sound rating required. Frames are available in 14 or 12 gauge with welded corner conditions, and can accommodate custom elevations including sidelights, borrowed lites and transoms – again depending on the STC rating required. Doors with visions are supplied with factory installed glass, while frames will come with the proper glass shipped loose. In addition to the aesthetic and sound control qualities, benefits of stainless steel STC door assemblies are a water-tight sanitary design that is easily maintained for long-term strength and durability. These products, like all multi-solution products, can be purchased through Ceco Door, Curries, Fleming or your nearest ASSA ABLOY Service Center.